Last time, we looked at a show that inspired my first job. Now we turn to a show about the job I think I’d be best at. 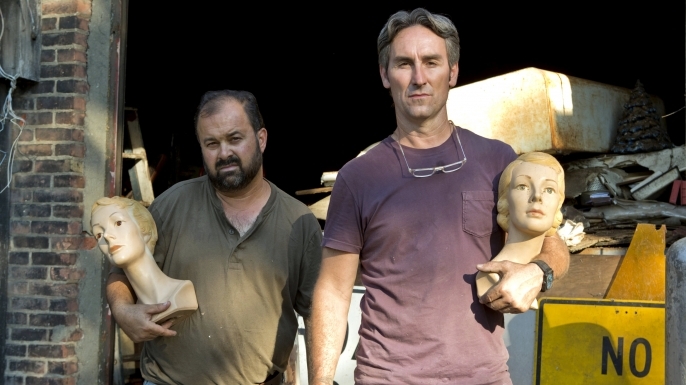 American Pickers follows the backwoods adventures of Mike Wolf and Frank Fritz. The two work as “pickers,” a manlier euphemism for “professional antique-shoppers.” Or maybe antique hunters is more accurate, as they actively seek out aging collectors looking to unload, and then sell their finds at a markup. In their totally non-sketchy large white van, Wolf and Fritz scour the hinterlands of America for “farm-fresh” treasures. Every hour-long episode chronicles two or three major “picks.” The show always seems to begin with Mike and Frank already in transit, though they inevitably receive their missions a minute or two into the episode, begging the question of where they were going in the first place. These marching orders come in from Danielle, the thoroughly tattooed manager of Roadside Treasures, the antique shop co-owned by the trio. The Pickers will then drive to the assigned property, almost always a heavily wooded lot owned by an older, “rustic” individual with a name like “Junkyard Jack” or “Hobo Joe” (sometimes, Mike and Frank conduct business with a younger descendant of the recently deceased Hobo Joe). These pick-ees have one major thing in common: all have amassed prodigious collections of old junk, typically stacked to the rafters in ramshackle “outbuildings” littering the grounds. The Pickers then spend some time prowling over, under, and through these piles. I always hold my breath, expecting that THIS will be the time one gives way and Frank ends up impaled on a pitchfork, or Mike gets the hantavirus from inhaling a mouse turd. Inevitably, though, they emerge unscathed and get down to some haggling. Negotiations are edited as dramatically as possible: if a potential seller turns out to be a “tough nut,” asking for exorbitant prices or refusing to sell altogether, you can bet we’ll get to see a close-up of Mike sweating, as well as a talking-head interview of him describing the same. Almost without fail, however, Mike and Frank overcome any resistance, either via purchasing several inexpensive “smalls” to break the ice, or Frank’s favored tactic of “bundling” several high-ticket items for a slightly reduced rate. Finally, the guys drop some cash and then ride off into the sunset as an on-screen calculator tallies up the profits they expect to net on their newfound booty. The Pickers tend to gravitate to the same kinds of objects time and time again. Frank looks for vintage advertising signage, and Mike seeks out antique motorcycles, particularly those manufactured by Indian. Both men go gaga for classic bicycles and old glass-top gasoline pumps. Unfortunately, none of these objects inspire especially stirring feelings in me. To be blunt, they strike me (with the possible exception of the motorcycles) as the kind of things Sesame Street’s hyperbolically boring Bert would be into. Luckily, we do occasionally get some outlier picks which provide just enough variety to keep the series fresh. 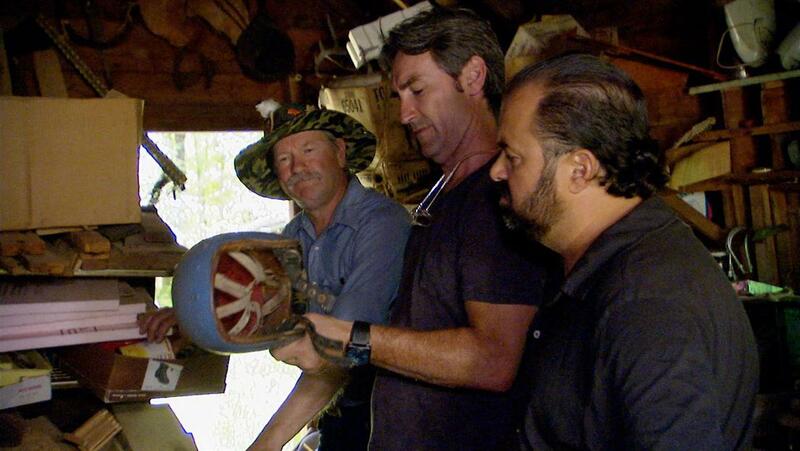 Sometimes, the guys will pay a visit to an old prop warehouse or small-town museum. One of my favorite early-season episodes sees Mike and Frank traveling to “the Forevertron,” a collection of enormous steampunk-style scrap metal sculptures. If anything, these eccentric picks have become more common as the years go by, and I’m not complaining. In one recent show, the Pickers hit up not only a collection combining “vintage circus,” Bavarian cuckoo clocks, and wax museum mannequins, but also a castle in upstate New York cobbled together over a lifetime by an eccentric artist with no formal architectural training. It’s a serious contender for the best single hour of television I’ve ever seen. I’m just barely old enough (or rather, my exposure to cable television is just barely old enough) to remember the “pre-History” days of The History Channel. For the last 10 years or so, the channel’s programming has drifted away from shows covering historical people and places, to instead feature a slew of “reality” style series whose connection to the network’s namesake is tenuous at best. The throwbacks of “Swamp People” may lay claim to a “traditional” way of life, but hour upon hour of monotonous alligator slaughter is more mind-numbing than didactic. Shows such as “Ancient Aliens” are even worse, portraying pseudoscientific views as equally valid to their more critically examined and evidence-based counterparts. Even for a cryptid fanatic like me, devoting multiple seasons to such topics seriously damages any academic credibility the channel may aspire to, and risks dumbing down the populace watching. A one-off special on “ancient astronauts” aired around Halloween is one thing. Whole years spent in the company of the crazy-haired meme man is quite another. However, I’m willing to cut the Pickers some slack. Inasmuch as it covers aspects of material culture and how it has changed over time, I’m comfortable referring to “American Pickers” as a “history show.” While their wheeling and dealing tactics may verge on exploitation of the elderly, and the depiction of the rustic poor for entertainment value raises some questions of its own… I can’t deny that I’ve learned things watching Mike and Frank go about their day. I was already a yard sale, flea market, and used book fanatic before seeing this show. Now, I’m an INFORMED fanatic. If nothing else, I now own far more Edison records than I would otherwise. 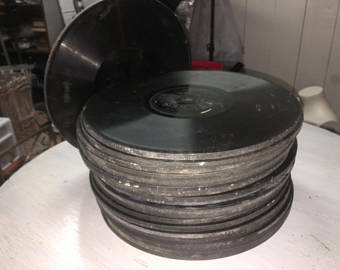 A proprietary format only playable on Edison brand phonographs, these noticeably thick discs lost one of the earliest “format wars” but are now highly collectible. At least, that’s what Mike and Frank tell me… interest in the large box I scored at a Washington state yard sale has so far been minimal. At any rate, old school History Channel purists can’t act TOO high and mighty. Even in its glory days, the channel was jokingly referred to as “the Hitler Channel” for focusing heavily on the dark, violent, and most titillating aspects of history. Ten-year old Brian vividly remembers a series on uncaught serial killers, and The mask of the Zodiac still haunts his dreams periodically. As they say, History repeats itself. But as long as we still get SOME interesting information coupled with our entertainment, I’ll continue to tune into series like American Pickers, and to champion their merits. Now, who wants to buy some Edison records?